Please send the nakshatras of boy and girl to poruthamnair@gmail.com. You will get Nakshatra Porutham as per Kerala Astrology, by Astrologer Remesh S Nair of modernastroservices.com. Before jumping into an application under the caption “FREE FREE” one must study the reliability and chances of success. Various free services are available in Internet related to astrology. We are not commenting on every branches of such astrology applications. But many internet people are using horoscope matching – Jathaka Porutham in wrong way. What Computers can Do and Cannot Do? According to Kerala Astrology Horoscope matching - Jathaka Porutham mainly consists of 3 parts: Nakshatra Matching, Grahanila Matching, Dasa Analysis. Among these people can use Nakshatara Porutham matching through internet free applications. The other two - Grahanila/Kundali Matching and Dasa Matching can only be done by a learned astrologer. Without understanding this basic fact many parents are avoiding good proposals by simply looking into the porutham matching report given by these free computer applications. 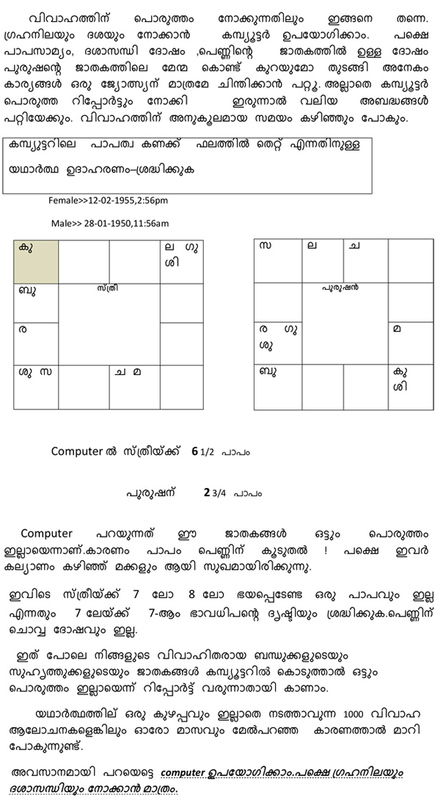 We strongly recommend Kerala viewers of this site to read and understand the below given guidelines about horoscope matching through computer.